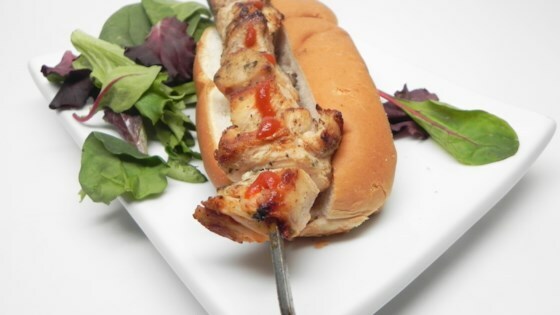 "Growing up in Upstate NY, this is a classic spiedies marinade for any form of meat (I prefer chicken, though lamb is the traditional) from Binghampton/Endicott area. Here is my personal take that I have switched up some adding ingredients from my time in the South and PacNW. Serve skewers on lightly toasted French bread or a hot dog bun. To eat, squeeze the roll and pull the skewer out - shouldn't need condiments (maybe a touch of hot sauce)." Combine oil, wine, lemon juice, vinegar, salt, pepper, thyme, oregano, tarragon, red pepper flakes, and cayenne pepper in a bowl. Stir in onion and garlic. Add chicken cubes last; coat thoroughly. Pour mixture into a resealable freezer bag, making sure there is as little air as possible in the bag. Wrap bag in a paper towel and slide it into another resealable bag so that the zippers are at opposite ends. Refrigerate, flipping over every 12 hours, for 2 to 3 days. Soak wooden skewers in water. Thread the chicken cubes through the skewers, discarding marinade. Preheat an outdoor grill for medium-high heat and lightly oil the grate. Grill the chicken skewers, flipping halfway, until juices run clear, 8 to 10 minutes. Discover America’s greatest unknown sandwich masterpiece! This recipe works for up to 3 chicken breasts. If you cannot grill, then broil in the oven 3 to 6 inches from heat source on high (you want just the slightest crisp to the meat). This is a great marinade! It was super tangy and worked good with chicken.